Probably no man in the world who wouldn't love seafood, which, of course, are shrimp. Not only are they insanely delicious, but also have a lot of useful and nutrients necessary for our body. Before shrimp was only available to the inhabitants of the sea coasts and people with fat wallets, now shrimp you can buy almost in every shop. Cook shrimp and enjoy their refined taste. 350 g of peeled shrimp. The first thing you need to prepare the marinade. To do this, mix 1 tbsp. of finely chopped parsley with 1 tbsp oil, a little salt and pepper, squeeze the juice of half a lemon. Spread in the prepared marinade the peeled shrimp. While the shrimp is marinated, prepare the batter. To separate the egg yolk from the white and whisk with salt, add 1 tsp of vegetable oil, 0.5 cups milk 0.5 cups sifted flour. All carefully to mix. Separately beat the egg whites and pour in the ground. Thawed peeled shrimp to take one at a time, and dipped in batter spread on a heated pan with lots of oil so they roast in the oven until the acquisition of Golden brown. In a bowl, combine salt with spices. Thawed shrimp put in a separate bowl and pour on top of mixed spices with salt, mix everything carefully and put into the refrigerator for 3 hours. Put on the fire a frying pan and pour a little olive oil. Spread on the preheated pan, soaked with spices prawns and fry on medium heat for 3-5 minutes until they become pink. Larger shrimp can be cooked on the grill. Heat in a pan with a small amount of vegetable oil and put into it two cloves of finely chopped garlic. Cut into rings onion and get the garlic in the pan, fry. Add 2 tablespoons of lemon juice, a little fresh ginger, paprika and salt. Put in a pan peeled shrimp and sauté 5-8 minutes, turning occasionally. 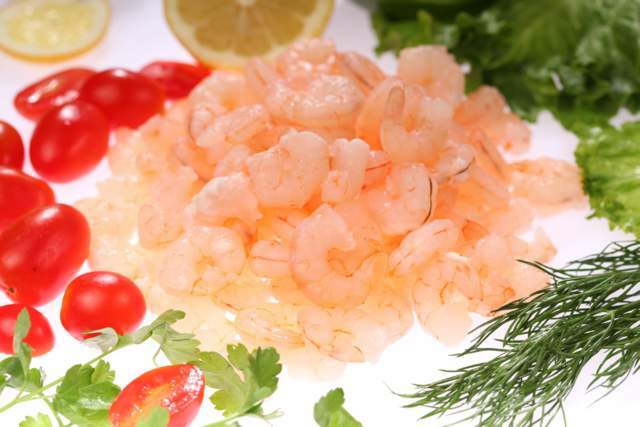 Serve festive shrimp with boiled rice, garnish with slices of salmon or Steelhead. If shrimp are pink, then they are already cooked. These shrimp only need to thaw and can be eaten. Thawed shrimp should be at room temperature, put it in a bowl.